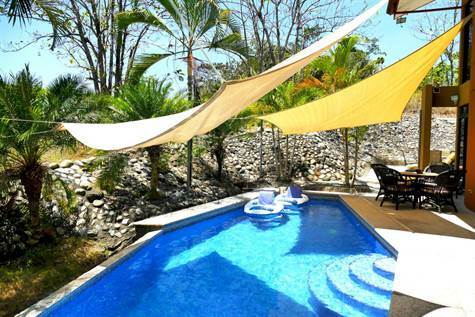 This 4 bed, 3.5 bath, luxurious home with private pool is located just minutes from the beautiful beaches of Esterillos on the Central Pacific coast in Costa Rica. And the spacious 3,150 square foot residence is located on a half acre cul-de-sac lot in a mountain-side gated community; providing privacy and seclusion, tucked next to the rain forest with abundant wildlife to enjoy. It features 3 spacious master bedrooms, each with en suite bathroom and large walk-in closets, plus an additional smaller bedroom that can sleep extra guests and be used as an office or den by day. One of the master bedrooms is so large it would fit two king-size beds in it! And each of the three master bedrooms features balconies or poolside terrace. The stunning home also has an open floor plan with a huge kitchen featuring granite counter tops and stainless steel appliances. It is two levels; with one master bedroom and bath, kitchen, vaulted ceiling living/dining room, laundry area and the smaller bedroom/den and half-bath downstairs. A catwalk divides two large master bedrooms suites upstairs to provide comfort and privacy for your guests. The home comes fully furnished, professionally decorated and turn-key so everything you need is right there from appliances and furniture, to pots, pans, dishes and more. It comes with high speed internet, satellite TV and excellent cell phone signal too. The pool has a waterfall to enjoy as you splash your cares away, along with a beautiful deck and dining area to relax and enjoy the tropical warmth and scenery. The home also features floor-to-ceiling windows to enjoy the views. Even better, owner financing is available to qualified buyers with just 25 percent down! And the home sits near a popular beach town where vacation rentals for this home bring in substantial income ranging from $175 to $250 nightly depending on season. Tucked into a quiet wooded corner of a large 24/7 guard gated community, the stunning home is very peaceful with abundant wildlife nearby, including parrots, toucans, monkeys, macaws, sloths, blue morpho butterflies and other exotic species. The property sits on 0.53 acres of beautifully landscaped grounds with a large two car open garage and a nearby roundabout to park additional cars also. The H.O..A. fee of just $112.50 monthly covers 24/7 guards, brick paver roads, streetlights as well as common area maintenance. Property taxes are only 0.25 percent of declared value, making for very low carrying costs. This is the home for you if you are looking for a carefree tropical lifestyle whether full or part-time. The owner financing can also make your Pura Vida dreams come true sooner, rather than later. Esterillos is known for its beautiful sunrises and sunsets and spectacular surfer\'s beach with tranquil tidal pools at low tide where families and children can play. Popular beach town Jaco is just 25 minutes to the north, while Manuel Antonio National Park is a half hour drive to the south. Fine restaurants and shopping are also just 5 to 10 minutes away.